If you’re in the mood for something hearty, filling and flavorful, try this easy recipe for sliced kielbasa and caramelized onions. This classic Polish dish is super simple to make after a long day at work or on a lazy weekend. 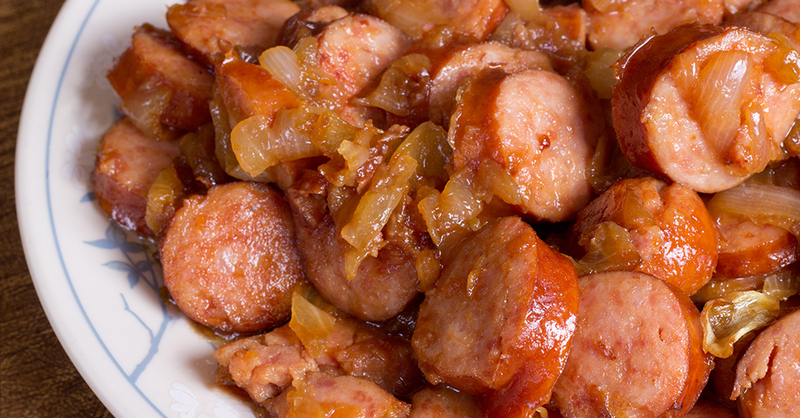 We love the way the pungent garlic in the sausage is balanced by the sweetness of the caramelized onions. Serve this yummy main dish with creamy mashed potatoes, or keep things lean with a side salad. Although we don’t often end up with any leftovers, when we do, we serve them up the next day on a warm bun with a drizzle of honey mustard dressing. But don’t take our word for it, give it a try and see for yourself! In a large skillet, heat one tablespoon of olive oil over medium-high heat. Add sausage slices, and cook until brown. Remove sausage slices from skillet, and drain grease. Add remaining olive oil and butter to the skillet and heat over medium-low. Spread sliced onions evenly over the bottom of the skillet. Stir onions to coat them with the oil and butter mixture. Cook onions for about 20 minutes or until soft and brown. If onions seem to be cooking too quickly, lower heat to prevent them from burning. Return sausage slices to the skillet, and stir together with the onions. Season with salt and pepper. Cook until sausage is warmed through. Serve immediately, and enjoy!